Doesn’t time fly? A month is nearly up, and it’ll soon be time for me to put up the submissions for this month’s TGRWT. If anyone’s planning on sharing some gastronomical delights, there’s still plenty of time to e-mail me with recipes and pictures. Believe me, what I’ve received so far looks just delicious! So as with a lot of foods, these isn’t any one single flavour compound that gives roses their beautiful flavour and aroma. Actually there are a selection of them. Collectively, these volatile molecules are known as rose ketones. 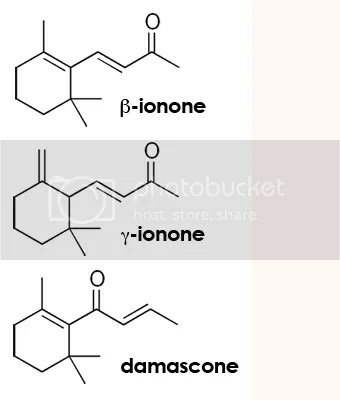 The main components are ionones, damascones and damascenones. The specific combination of these is one of the reasons why different roses are prized for subtly different aromas. Back when I was actually studying aromatherapy, rose oil was probably the most expensive essential oil in the world. It probably still is, even though techniques for making it have improved (they extract it with supercritical carbon dioxide these days). Good thing then, that rose ketones don’t need to be present in very high concentrations to be noticeable. Even in the roses themselves, the aroma compounds are found in surprisingly low concentrations. Actually, these compounds and other similar ones are found in a wide range of different foods (particularly raspberries and certain red wines), albeit usually only in small amounts. In cooked foods, they’re actually found in several root vegetables, because rose ketones are produced when beta carotene starts to break down. Similar partially oxidised fragments of carotene can contribute to the flavour of cooked carrots, parsnips and sweet potatoes. This entry was posted in Imported from Livejournal, molecular gastronomy and tagged molecules. Bookmark the permalink.